Nearly two weeks after the killing of a Rashtriya Swayam Sewak (RSS) leader in Ludhiana, unidentified assailants shot dead Vipina Sharma, leader of a lesser known Hindu outfit Hindu Sangarash Sena in broad day light on Monday. According to reports, four unidentified assailants arrived on two separate motorcycles at Bharat Nagar, Batala Road at around 3 PM on Monday. Sharma was accompanied with his friend on motorcycle and was on his way to home. 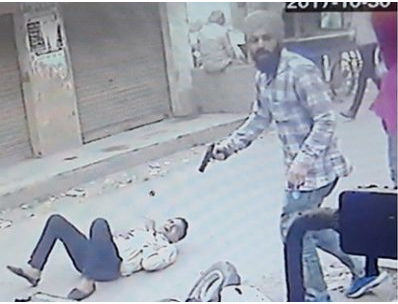 As the two turbaned gun wielding assailants intercepted the motorcycle, Sharma fell on the ground while his friend fled. The accused opened fire on Sharma from close range while their two accomplice were standing at a distance. Sharma died on the spot. The incident was recorded on CCTV in which two turbaned persons are seen shooting Sharma. Notably on October 17th, RSS leader Ravinder Gosian was shot dead in Ludhiana. Police have issued an alert and sealed all the exit points of the city. Amritsar police commissioner SS Srivastava informed that they had ‘some’ suspects but added that police had not arrested anyone so far. He informed that till now there was no information of hand of any Sikh hardliner organization behind the killing. He said police was trying to trace the culprits on the basis of CCTV footage. Local residents informed that Vipin Sharma had a cable TV agency and for nearly a decade was an active Hindu leader often organizing Jagran and other Hindu religious functions. Police sources informed that in past Vipin had received life threats from unknown persons. Meanwhile BJP national secretary Tarun Chugh blamed Punjab’s Congress government for its alleged failure to maintain law and order. “Incidents of attack on Hindu leaders are increasing, instead of providing them with security cover police had withdrawn their security” he said. RSS leader Ravinder Gosai was shot dead by unidentified men in Ludhiana earlier this month. In January this year, Amit Sharma (35), district publicity manager of Hindu organisation Sri Hindu Takht was shot dead near a temple in Ludhiana. In August last year RSS Prant Seh-Sanchalak (vice-president) Brig. Jagdish Gagneja (retd) was shot in Jalandhar and later died of his wounds. None of the killers in the above mentioned cases have been caught as yet. The eminent intellectual class of this country has been up in arms over the murder of so-called rationalists like Narendra Dhabolkar, Govind Pansare, MM Kalburgi and Gauri Lankesh over a span of 4 years in Maharashtra and Karnataka, with 3 of those murders occurring under Congress rule. Every Lutyens’ commentator worth his salt has ranted against the Modi Government for the alleged ‘rising intolerance’ they claim to be behind the murders of these anti-Hindutva activists. But when a Hindu activist or leader dies, there is pin drop silence in the elite class. There might even be smiles and clinking of glasses to celebrate when Lutyens’ charmed circles gather for their end of day soirees. Sadly, even BJP and RSS have failed to effectively highlight the very real, very dangerous intolerance against their workers which is now starkly apparent in states as far flung as Punjab, Kerala, Tamil Nadu and many other states.